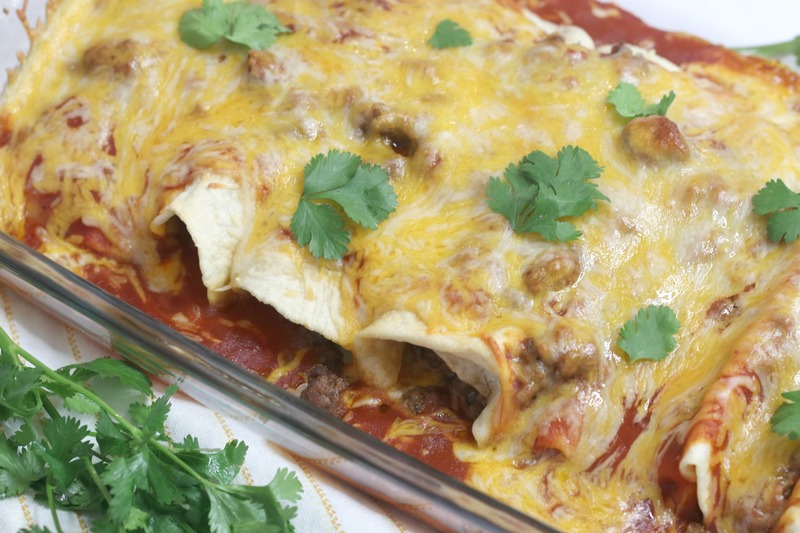 Authentic Ground Beef and Cheese Enchiladas with only 6 ingredients! This easy dinner recipe is a family favorite and filled with ground beef, cheese and covered in red sauce! Enchiladas are a fave in our family! We do not discriminate when it comes to our enchiladas and load them up with a variety of fillings. I mean, who doesn’t love tortillas filled with deliciousness and covered with cheese. 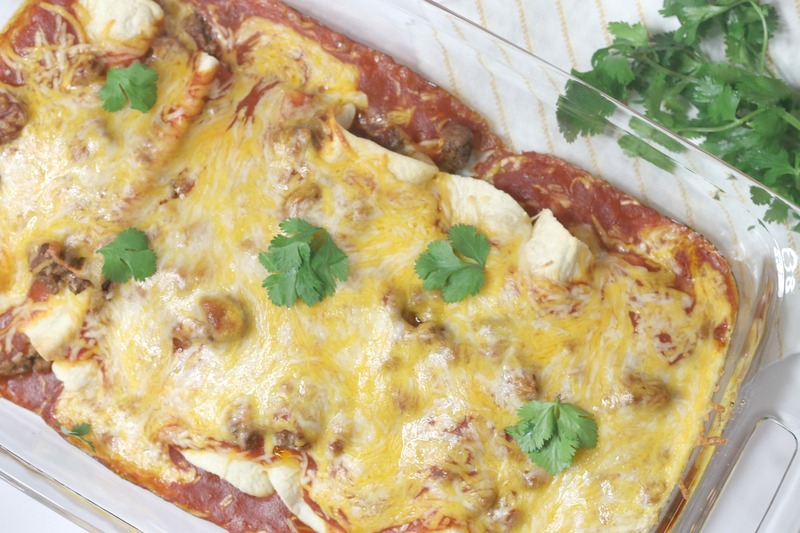 I love making these enchiladas for a quick and easy dinner. I love to make my own sauce for our enchiladas but for these quick beef enchiladas I used my favorite Old El Paso Red Enchilada Sauce! These enchiladas only have 6 ingredients all of which are easy to find and pick up! I cannot tell you how many times I have run into the grocery to grab these ingredients and have dinner made within the hour. I made my enchiladas with flour tortillas but you can definitely use corn as well. I love the homemade tortillas from H-E-B. They are ridiculously delicious and always a hit! No matter what kid of tortilla you choose, flour or corn, these easy beef enchiladas will be a hit! I use large tortillas so this recipe makes about 10 enchiladas per dish. 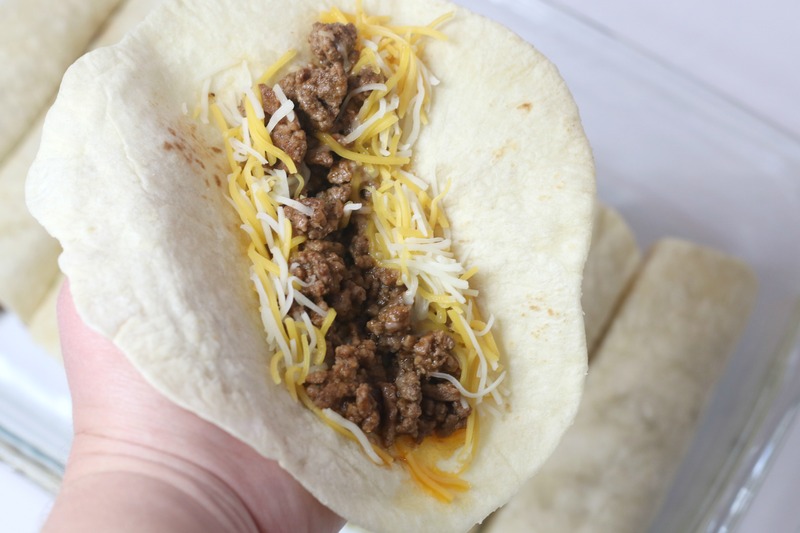 Just fill your tortillas with your beef mixture and sprinkle with cheese. Place your enchiladas in your dish, cover with sauce and cheese and bake. Told you they were easy! I love to serve these enchiladas with Mexican rice and black beans. We of course always have to have chips and salsa on the side. Hello, Mexican food! This easy dinner recipe is perfect for busy nights and busy families. Also, don’t forget the guacamole! Yes! I usually make these in the morning and put them in the fridge. I pull them out while the oven pre-heats then pop them in. 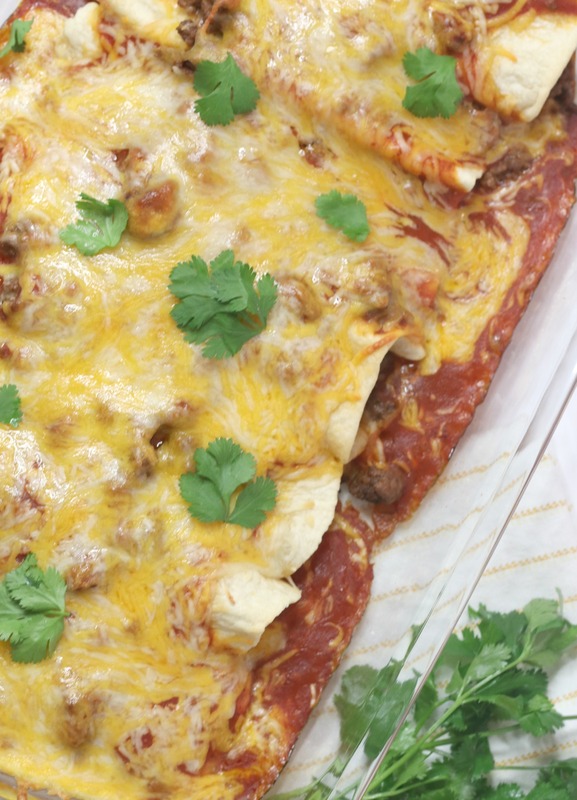 Can you freeze beef and cheese enchiladas? Of course! Yes, you can actually freeze any kind of enchiladas. Just be sure to keep your enchiladas air tight by covering them with plastic wrap and foil. 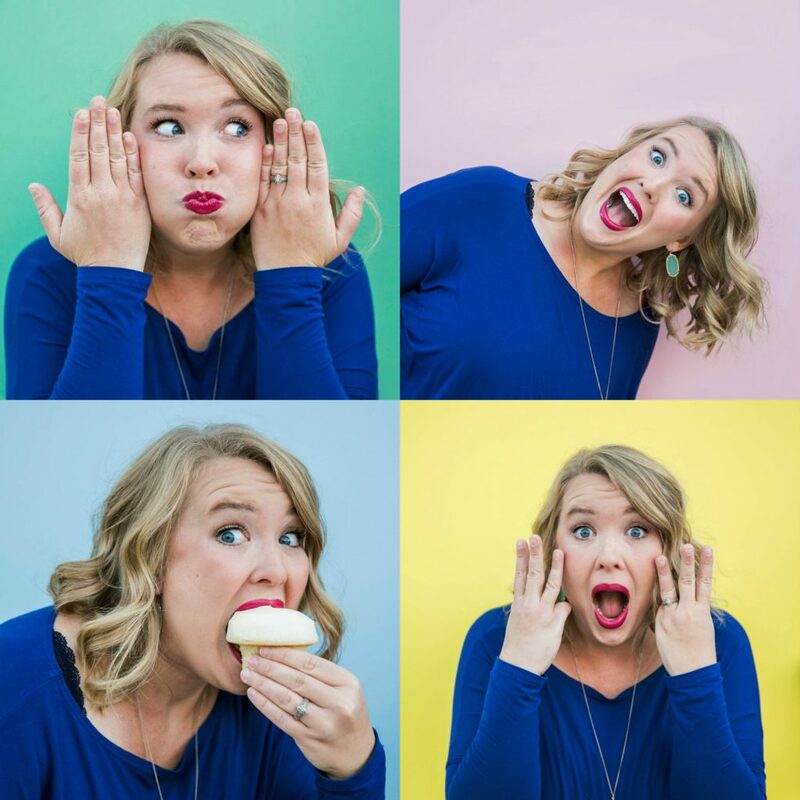 Eat within 1 1/2-2 months. We prefer ground beef for the authentic taste but you can definitely use ground turkey if that is what you prefer. Our family loves these enchiladas! I hope your clan enjoys them as much as we do! 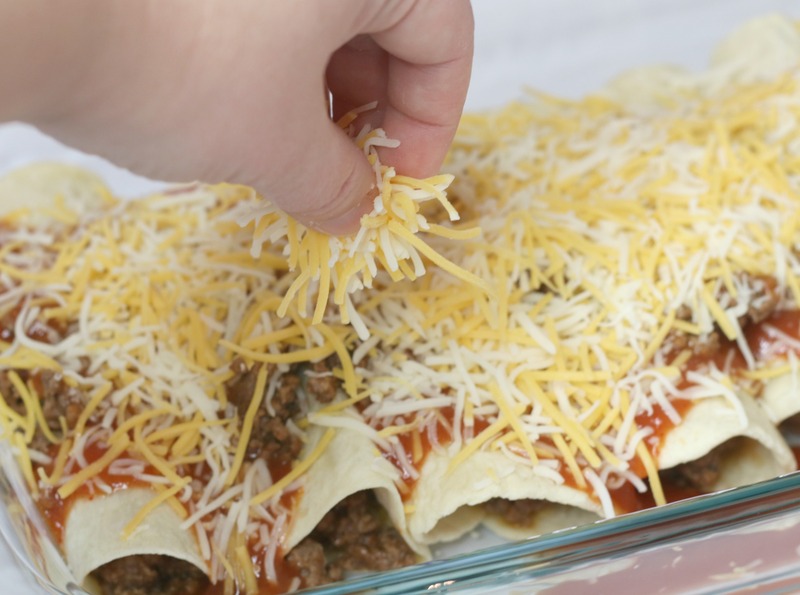 Authentic Ground Beef and Cheese Enchiladas with only 6 ingredients! This easy dinner recipe is a family favorite and filled with ground beef, cheese and covered in red sauce! Add oil or butter to pan and heat on medium/high heat. Add in ground beef and saute until brown and cooked through. Once meat is browned add garlic salt and 1 tablespoon of enchilada sauce. Take 1 tortilla at a time and add a large spoonful of beef mixture and sprinkle with cheese. Fold each side of the the tortilla in tightly and place seam side down. Repeat with each enchilada until dish is full. Cover enchiladas with remaining enchilada sauce making sure the enchiladas are completely covered. Sprinkle cheese and cover completely. Bake for 20 minutes or until cheese and sauce are melted and bubbly. Serve hot!